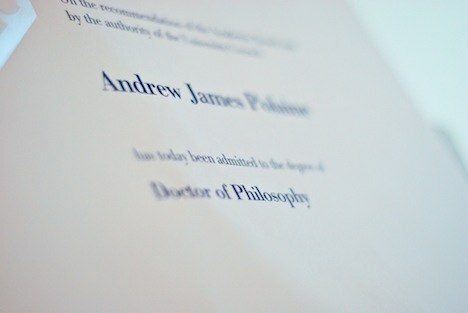 No one fails PhD; they just rise up to the heavens… the spirit that is. The pressure when one could not find time to finish his/her PhD is unbearable. It is hard to imagine that someone would continue to endure the painful burden of doing PhD but that someone has made a pact and has to abide by it whether he/she likes it or not. In the beginning it was a world of fun and pride but later on it wasn’t that much to talk about. Then one fine day you will realise that it is much more than just a burden of the work but the whole world is crumbling on you. The sad thing is that you have to face it one way or another with your head or with your tail. There is no escape this time; the fun has to stop and find a way to get it over with. Maybe one question keeps popping up — why me? Why this is happening to me ? (okay two questions!) no one has the answer except yourself. So it has become more complicated. We like to blame others, it is easier that way, so we remain the good guy that falls victim to someone else. But you know what?! It is time to let the dust settled and see where we are standing . maybe you want to continue walking or maybe you just want to quit; it does not really matter. Let’s clear the air and let you see the path ahead. Do you see delightful green pasture or just a dark and dull pathways that you have been so many times before?…now it is time to answer it with your heart. Many, like myself, would prefer to try one more time. Everyone has done it, why can’t I? It emerges from the many failures that all PhD candidates had gone through. We failed to impress our supervisors, failed to show impressive outcome, failed to get into top journals, failed to win any awards ; the fail-things just never stop. But we kept going until the money and the time ran out. That was the time when the dream collapsed and shattered into a million pieces. Is there any more energy to pick up the pieces and do it again? It’s like a sharp knife slicing a piece of your heart out. Very painful indeed. Maybe all you want to do is to curl up into the corner, close your eyes and hope for the pain to go away. It will never go away; and you know that too. What is there to burden yourself, this PhD thing will never make you happy. A sour-grape-thingy creeps into the mind so everything seems to be alright. The answer to this predicament is to stop running; just stop it and face the gun. But things won’t be easy. It might be harder than everything that has been confronted us before. The hardest part is to make our own self accepts the fact that something must be done and the time to do it is now. Not tomorrow or the day after tomorrow. Acceptance is always the hardest part because it reflects our own effort and capacity. The fact that we are incapable of something draws in inferiority and degradation. That could be resolved with a sense of honesty; to one self and everyone around us. Being honest would lead you to a whole new dimension in life and takes you further without limit. This key inner strength will be your bean bag in case you fall again in the course of this new journey. This key will open up many doors that have never been opened before for you to see your journey in a whole new dimension. Be honest when you talk to your supervisor or your friends about the research. Seek their opinion when you know he/she is an expert in the area. With it people will help and soon things will get much more easier to manage. Good luck in your PhD!.